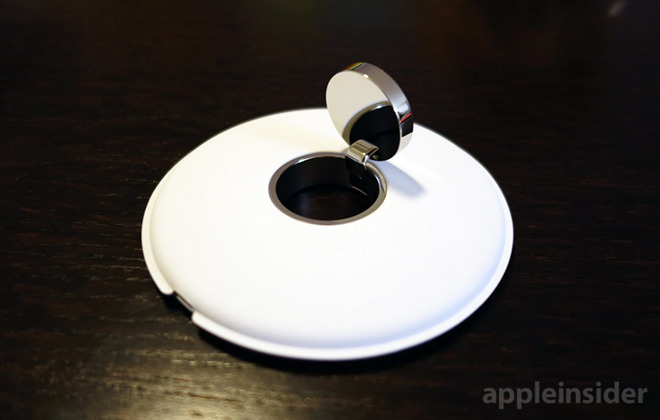 In spite of an uninspired name, the Apple Watch Magnetic Charging Dock is a revelation in design. Seriously. Its manner is nuanced and organic, more so than iPhone, iPad or even the cylindrical Mac Pro, and while Apple turns to familiar materials —rubberized sheathing, velvety cloth, immaculately worked metal —the form is fresh. Unlike most contemporary Apple designs, the Charging Dock is adorned with seemingly superfluous flourishes. For example, a bit of matte white soft touch rubber skin pulls down from the dock's canopy and protrudes slightly along its perimeter, but it serves no purpose other than to accentuate the gently curving lines. 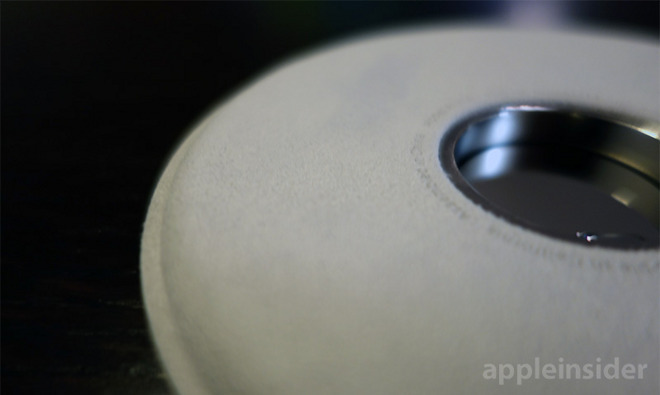 It's soft, flexible, and with it the dock resembles a plump dumpling. 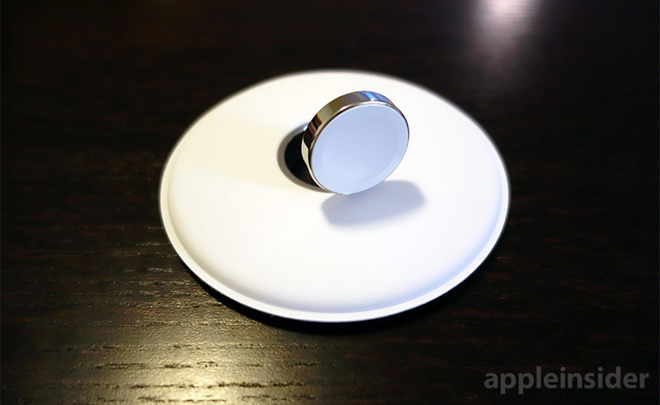 A glassy metal ring rims the cavity into which a magnetic inductive charger puck folds. Flipping the puck up reveals a metal casing of equally high polish, a departure from the standard brushed veneer found on Apple's gratis Apple Watch Charging Cable. From the top the charger looks like a flattened dome with concentric circles radiating outward from its middle —the beveled inductive charger, the puck's polished backing, an indented metal ring embedded into the sloping chassis —all terminating in the thin loop of excess rubber. Compared to Apple's iPhone dock —a staid slab of aluminum billet, circumspect by design —the Watch dock quietly, but forcefully, demands attention. Apple Watch designer Marc Newson almost certainly had a hand in creating the Magnetic Charging Dock. It reflects his penchant for long, sweeping curves and disdain for right angles. Watch aficionados will immediately draw parallels to the tiny cushions that are often presented with traditional timepieces, but a more apt analogy would be Newson's handiwork at Swiss watchmaker Ikepod. Newson cofounded Ikepod in 1994 before leaving the company in 2012. Specifically, Apple's Watch dock bears a striking resemblance to the UFO-shaped watch boxes that came with Ikepod's Isopode and Megapode models (the watches themselves also sport a flat obloid shape). That Newson's design language spilled over into another Apple Watch-related product should come as a surprise to no one. Apple borrowed heavily from Newson's past accomplishments in creating its accessory lineup, the most obvious case being the Sport Band, a near carbon copy of Ikepod's rubber strap. Apple Watch itself shares a silhouette with the Ikepod Manatee and, to a lesser extent, Solaris. 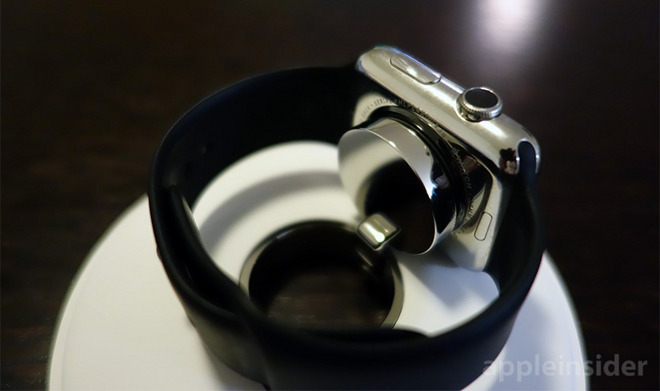 Functionally, Apple's Watch dock has one purpose: latch on to and inductively charge Apple Watch. Everything works as expected, that is to say identically to the Magnetic Charging Cable that comes in every Apple Watch box. 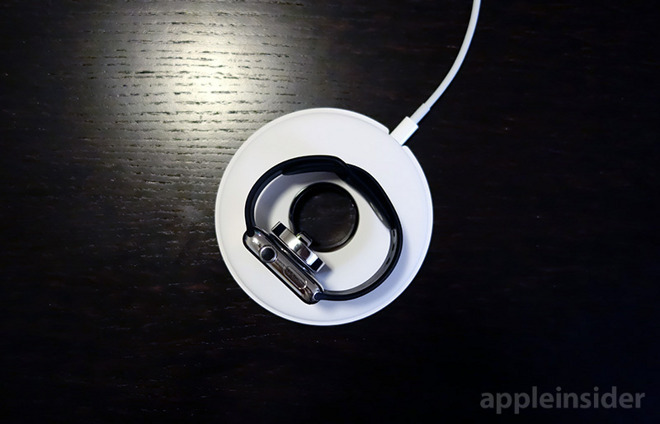 Charging Apple Watch with the included cable always felt like a stopgap solution, however. Laying the device face-up on a waiting charging puck, or propping the device on its side to activate nightstand mode, fails to take full advantage of an inductive charging setup. Like Lightning, users sometimes need to fiddle with the cable when it should be a completely cord free experience. With Apple's new dock, however, owners have a purpose-built accessory. Build quality is superb, as is expected of all Apple products, with minimal moving parts and the usual attention to detail. The central charging puck, which flips up or down depending on user preference, is attached to the main dock body via an L-shaped metal arm. A tilt mechanism provides friction to keep the puck stable and is silky smooth in operation. With the puck folded down, Watch can be easily dropped into place at night, and a weighted base translates to one-handed retrieval in the morning. Because Watch rests on what amounts to a raised pedestal, buckle-type bands have room to unfurl naturally, preventing hyperextension at the lugs. Alternatively, the central inductive charger can be flipped up to hold Watch vertically, a plus for users running watchOS 2.0 with nightstand mode. Underneath is a felt-like material identical to the lining found in Apple Watch boxes. While not as "sticky" as an iPhone dock's rubber foot, the cloth offers reasonable traction to prevent sliding. Apple includes a two meter Lightning cable for easy routing from an outlet to the top of a nightstand. The Magnetic Charging Dock's inconspicuous launch belies its importance as a harbinger of Apple design, which seems on course to blur the line between tech and fashion. That said, the dock's spaceship-esque design is at odds with almost all current Apple products, which might pose a problem for some. For all its beauty, however, the Charging Dock is still a dock. There are numerous third-party offerings that serve the same basic purpose while coming in well under Apple's $79 price tag, albeit without an inductive charging module. First-party Apple docks are notoriously expensive, but in this case we can see the appeal. The kit includes a two-meter Lightning cable, normally priced at $29 on Apple.com, putting the Watch dock with its inductive charging puck and moveable parts at $50. That price is in line with Apple's new $49 aluminum iPhone docks. If you happen to be looking for a high-quality, high-function Apple Watch dock, and Apple's fashion forward aesthetic suits you, there is no better option on the market. 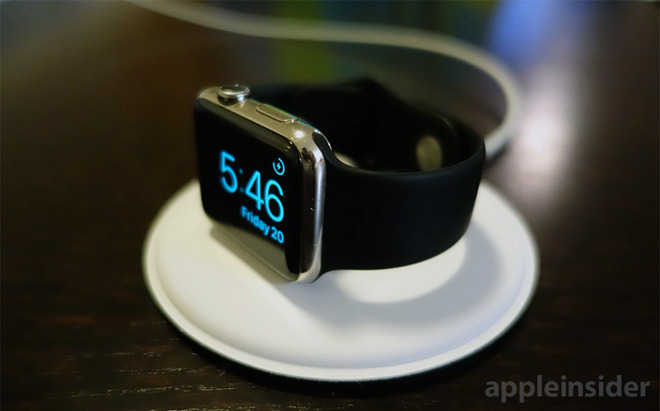 The Apple Watch Magnetic Charging Dock is available for $79 from Apple's website and brick-and-mortar stores.